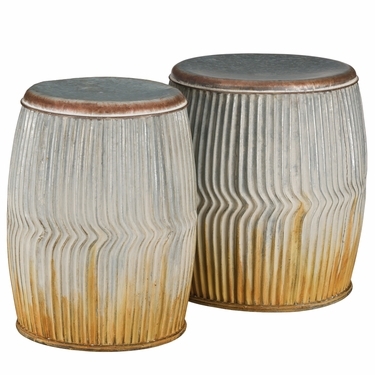 Our Galvanized Ridges Garden Stools are as functional as they are decorative. These versatile nesting stool sets can be used as accent tables, as an ottoman, or for extra seating when unexpected guest arrive. Or flip it upside down and use them as decorative planters or storage! This unusual design is handcrafted from deeply embossed metal that is galvanized which is painted to look like well-loved weathered metal. Made from durable, weather-resistant metal to enjoy indoors or out. Sizes: 16" x 19"H and 13" x 18"H. Each holds up to 200 lbs.